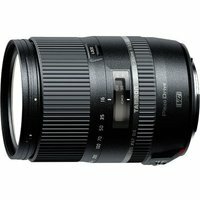 The Tamron 16-300mm f/3.5-6.3 Di II VC PZD Macro lens for Nikon is the ideal "one lens solution" for travel and is the first lens for an APS-C sensor (equivalent 35mm focal range approx. 25-465mm) with a versatile 18.8x zoom. The near-silent PZD (Piezo Drive) focusing and VC (Vibration Compensation) system provides accurate focusing and reduces unwanted camera shake to ensure your photos are kept sharp, even in low light environments. This cutting edge design also incorporates Tamron's moisture-resistant construction for greater protection outdoors and features an impressive macro capability giving scope for "up close" creativity with even the smallest subjects. This compact lens is a great all-rounder for capturing sport, wildlife, portraits, travel, landscapes, macro and more.